BlueWire TV Antenna Reviews - Is It a Scam or Legit? The BlueWire TV antenna is a new TV antenna that receives existing HD television signals, providing you with HD access to local television stations and other channels like Home Shopping Network. The site makes mention of the fact that the antenna doesn’t require any internet or WiFi connections, nor does it require a subscription fee. Also, the site mentions that you get all your channels legally; you aren’t breaking the law by using it. The site’s description of the antenna is certainly intriguing but requires some additional examination to help you understand how the antenna works, how much it costs, and how it compares to other TV antennas that claim to provide HD channels. It wasn’t but just a couple of decades ago that many homes had antennas on top of their television that allowed them to access local networks and a few random national stations. This meant that you didn’t have to pay for cable subscriptions, for example, to watch broadcasts from NBC, CBS, ABC, FOX, and other stations. Think of the BlueWire as the new iteration of that old antenna model. It’s a flat antenna – no bunny ears – that you can fix to the wall of the room your TV is or just lay it flat on your entertainment center. The antenna uses a coaxial cable that plugs into the back of your TV. When you turn your TV on, you’ll want to access the settings and get to the screen that allows you to auto-scan TV channels. What this means is that your TV will use the BlueWire to search which channels’ signals are clear enough to watch, then store those channels. Once the channel scan is complete, you can start watching television. Now, there are a few things you should know about what the BlueWire antenna can and can’t do. First, the antenna can capture HD channels as well as standard definition channels. This trait is something shared among all HD TV antennas. What the BlueWire can’t do is provide you access to any special channels (ESPN, HBO, Discovery, etc.) or generate channels on its own. The antenna is acting as a recipient of the signals that are moving through your home, just like any other antenna. Because all HD antennas pretty much work the same way, the important bits of information you should know are how much the antenna costs and how well people say it works. Before we cover that information, though, we want to point out that you may have to face your BlueWire in certain directions in order to get certain channels. For example, if your BlueWire is facing south and your local NBC station transmits a signal from the east, you may get a choppy signal unless you turn your antenna east. Pro tip: Use the FCC’s signal search site to search your zip code and see from which direction various stations are coming. This will help you know where to face your BlueWire in order to get the best reception. While we can’t confirm how many antennas were left at the time we came to this page – BlueWire said 58 – we do know this is a common marketing tactic among many different sites intended for you to feel a sense of urgency about your purchase. Below the notice is the first of three questions the site wants you to answer before you make your purchase. The first questioned pertained to where you heard about BlueWire, how much TV you watch each week and how much you pay in cable each month. You’ll pay about $15 less per antenna if you buy five, making the bigger purchase the better value. You’ll also have the choice of buying a $7.99 lifetime warranty that promises free replacement if your antenna stops working. The warranty applies to all antennas in your purchase, whether you buy one or five. If you need to cancel your order, you should do so within 24 hours of your purchase. BlueWire recommends emailing their customer support team to cancel: support@bluewiretv.com. If you aren’t satisfied with your antenna after you receive it, you have 30 days from the day your antenna arrived to get it back to BlueWire. In other words, they have to have the antenna in their hands before the 30-day deadline. To make a return, you’ll need to get what’s known as a Return Merchandise Authorization (RMA) from BlueWire’s customer service. To do this, send them an email at support@bluewiretv.com. You’ll need to send the antenna and the original box back with the RMA written on the outside of the box. The return address is: Attn: BlueWire TV Antenna, 925 Hale Place Suite B3, Chula Vista, CA, 91914. We’d classify BlueWire as a passive antenna, which means it doesn’t have a power source that increases its ability to grab signals. As such, we’ll compare it to a pair of the best-selling passive antennas from Target: the Philips Flat Panel HD Passive Antenna and the Philips Traditional HD Passive Antenna. Normally, we’d compare the customer reviews BlueWire gets to the reviews the other two antennas get but, at the time of publishing, BlueWire had no customer reviews that we could find. That being said, the Philips flat panel received six reviews for an average rating of just over four stars. The traditional Philips antenna received 14 reviews for an average rating of just a shade over four stars. 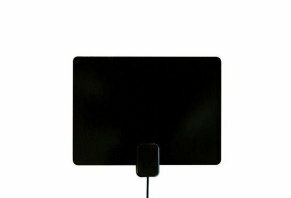 As far as price goes, the flat panel antenna was $19.99 and the traditional antenna was $10.99. So, price-wise, both of these popular Target antennas are significantly cheaper, so much so that you could buy two flat-panel Philips antennas for the same price as one BlueWire. This is a key point of differentiation considering the three antennas function in pretty much the same way – they receive HD and SD signals. Also, both Target antennas note that they provide 1080p HD and are equipped for 4K, whereas the BlueWire does not make mention of its level of HD quality. This particular antenna is a great option for those who are looking to cut the cord and get channels for free. Paying a one-time $39.99 fee plus around $5 in shipping will be cheaper than paying a cable bill in the long run. However, remember that your local cable companies may offer you cable-plus-internet packages that may be as affordable or cheaper than internet-only packages offering the same speed. If this is the case, then check to see if the cable packages that offer better value provide HD stations. For example, in our city in Florida, we can get a basic cable package through Comcast. However, that package does not provide HD channels, which means that we’re better off using our antenna to get local channels and casting our phones or laptops for channels we have access to online. The downside to this antenna is its price. You have many different highly-rated options to choose from big-box stores like Target, Walmart and Best Buy. If you’re not sure if this antenna is right for you, you can read our reviews of three other antennas you can buy online: Clear TV, SkyLink Antenna, and SkyWire TV Antenna. Doesn't work, can't find any way to return. I bought this to try as I live in a semi-rural area. It only picked up two stations. I thought I was doing it wrong and so kept on trying to load stations and determine if I liked it or not. It wasn't of benefit to me, so, I looked for a customer service number, of course, there was none. I emailed the customer service listed and I have had no reply since 3/18/19. How ethical is it for require you contact them within 24 hours when it is a technical item that may or may not be to your benefit. Especially since I was out of town and it came while I was gone. I believe this is a very deceitful company. Their reviews are on their own website and are not confirmed. You get no order number or invoice. I'm going to stick to Amazon. One key thing left out of the advertisement - your TV has to have a USB outlet for the antenna to work. Once I opened the package and realized this, I immediately emailed support@bluewiretv.com, this was February 15th. As of today, March 10th, I’ve received no response. Basically, I have a useless antenna. Is this a viable product? Data online looked good, received in a timely fashion. Plain envelope, no order data, no name, no instructions. I had to look back at purchase history to even find the name of the company. Looked at the website again, no help there, no customer service. Is this a scam? I have requested by phone and email help with product, so far, nothing! I would definitely NOT recommend this product to anyone. The ad shows and focuses your attention on a small square device that leads you to believe you're buying a piece of new technology, instead, they send you a $2 piece of crap antenna you can buy at Walmart. THIS IS A SCAM, BEWARE. You're better off with an aluminum hat! I have tried and tried to get an RMA number because the antenna cannot be connected to my TV. It has not been used and I want to return it but can't get a response for the return authorization number, especially since it must be returned within 30 days. I purchased two BlueWire Antennas from the BlueWire TV site. I confirmed that all three major channels were less than 20 miles away, well within the 30 mile range that BlueWire claims to receive. I tried the antenna in several different positions, including the window position that they recommend. The best I received was a weak, pixelated signal of only one if the three major network channels. At this point, I am out $69.90 and still have a $167 per month cable bill. After purchasing the BlueWire Antenna the purported 30-60 channels were not even close. I tried in two locations and had my tech-savvy son also try with the same results. A whopping seven channels and two were in el Espanol. And another two of the remaining five were shopping channels. Write a Review for BlueWire TV Antenna!